The Carrera series is the most successful and well-known TAG Heuer collection. As its name suggests, this classic series from the Swiss manufacturer was inspired by car racing. It features both chronographs and traditional three-hand watches. 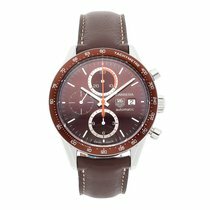 Heuer (known as TAG Heuer since 1985) introduced the first Carrera in 1963. Jack Heuer, great-grandson of the company's founder Edouard Heuer, was at this time the official timekeeper at the 12 Hours of Sebring race in Florida. Jack Heuer struck up a conversation with racers Pedro and Ricardo Rodriguez in the pit, and the brothers excitedly told him about the legendary Carrera Panamericana race in their home country of Mexico. Their stories impressed Heuer so much that he devoted an entire watch to the race, the Carrera. Its functionality and reliability made it the watch of choice for racing legends such as Niki Lauda, Jo Siffert, Bruce McLaren, and Ayrton Senna. However, even hobby racers and office workers love this watch. Thanks to its elegant and timeless design, it goes just as well with racing suits as it does with business suits. Other models, such as the Monaco and the Aquaracer, benefit from the functions and history of this wristwatch. The first Carrera watches from the 1960s impressed with their clean, simple design and orderly dial. The dial had a 45-degree angled edge and featured 1/5 second demarcations. This construction resulted in an easier-to-read dial about 2 mm larger. The watch's designers forwent tachymetric and telemeter scales, unlike Rolex's Daytona and Omega's Speedmaster chronographs, which each have a tachymetric scale on their bezel. Heuer's designers set the subdials for the subsidiary seconds and minute and hour counters deeper into the dial, creating a three-dimensional effect. A date display was added a few years later. The same manual caliber that powers 1960s Rolex Daytonas, the Valjoux 72, powers this 36 mm timepiece. The movement has a power reserve of 46 hours, 17 jewels, and vibrates at 18,000 alternations per hour (A/h). Heuer continued producing the classic Carrera models up until the 1980s. In 1996, Heuer brought the Carrera back to life with its Classic series, and they released a vintage-style Carrera in 2015. This retro watch, the Carrera Telemeter, measures in at a diameter of 39 mm, closely resembling its sibling from the 1960s. The two anthracite-colored subdials at the nine o'clock position (30-minute counter) and three o'clock position (subsidiary seconds) contrast against its silver dial. The dial's edge features a telemeter scale, which can be used to measure how far away an imminent storm is. The vintage "Heuer" (without TAG) logo calls to mind the first versions of the watch. A black, perforated leather strap rounds out this timepiece. TAG Heuer's Calibre 18 ticks away inside the retro watch. The movement is a combination of the 2892 caliber from ETA, completed with the module 2223 from Dubois Dépraz. The Swiss manufacturer ETA is one of the most prominent producers of watch movements, while Dubois Dépraz specializes in movement complications. The manual chronograph movement Calibre 18 measures 28 mm in diameter and has 37 jewels. A date display is located at the six o'clock position, and a quick-set function allows the date to be corrected quickly. The movement vibrates at 28,800 A/h and has a power reserve of 40 hours. A sapphire crystal back allows a view of the caliber and rotor. In 2010, TAG Heuer presented their in-house caliber, the Calibre 1887, in celebration of their 150th anniversary. The movement is based on Seiko's caliber 6S78, which is most often used in the Japanese manufacturer's Credor collection. TAG Heuer considered this work to be the ideal candidate for their own caliber, seeing as it fulfilled many requirements: It's flatter than the Valjoux 7750 and has a column wheel as well as an oscillating pinion. Edouard Heuer, the company founder, invented and patented the oscillating pinion in 1887. The mechanism is comprised of a mobile stem and two pinions which regulate the stopping and starting of the chronograph function. This mechanism is considered particularly reliable. The blued column wheel is this caliber's greatest advantage, as it ensures the start-stop and reset buttons function smoothly. The movement has a diameter of 29.3 mm, 39 rubies, and rapid date correction. The balance wheel vibrates at a frequency of 4 Hz, or 28,000 A/h. The power reserve is 50 hours and 40 when the chronograph function is running. The subsidiary seconds dial is located at the nine o'clock position, the minute counter is at twelve o'clock, and the hour counter is at six o'clock. A stop-seconds mechanism allows the time to be set to the exact second. The size of the Carrera has steadily grown over the years. The first versions of the Carrera from 1963 were 36 mm in diameter, while the versions today have a diameter of at least 39 mm. Versions with diameters of 41 mm, 43 mm, 44 mm, and 45 mm are also available. The design of the watches has also changed over time. A tachymetric scale on the bezel, as well as the contrasting subdials and hands, add to its sporty feel. Red seams on the leather strap match the red accents on the hands, dial, and crown. Alternatively, alligator leather, stainless steel, and rubber straps are also available. The McLaren 1974 Edition is a tribute to the success of the British Formula 1 driver and features "McLAREN 1974 EDITION" engraved in orange on the bezel. The dial is white and features large index markers from 05 to 60. The watch's black rubber strap has a tread pattern. The three-hand models in the Carrera collection are simple and elegant in their design, with no trace of their racing roots to be seen. Two-tone versions made of stainless steel and yellow or rose gold have an especially stylish flair and are perfect for the office or a nice dinner. The dial is clean and easy to read, and line indexes or Arabic numerals work together with the thin hands to tell the time. The Twin Time models have a fourth hand for the GMT function and are perfect for the frequent flyer, as they can keep track of two separate time zones. The three-hand versions are available with a date or day date display, and all newer models are waterproof to 100 m.
The watches from the Carrera collection are inspired by racing through and through. After all, TAG Heuer did originally develop them for professional race car drivers. However, today, fans of the watch are from all walks of life and the Carrera can often be found beyond the racetrack. The design of the watch is popular for its elegance and timelessness - one reason the wristwatches from this series are some of the most successful and coveted chronographs in the world.